System Information for Windows - siw.exe | Tech for Lunch! Every once in a while, comes a cool application that becomes a must-have in your toolkit. I work on the road a lot and connect to many customers’ machines remotely as well. I very often need to know what hardware is in their machine and I don’t want to have to install any software on their machines to get that information. 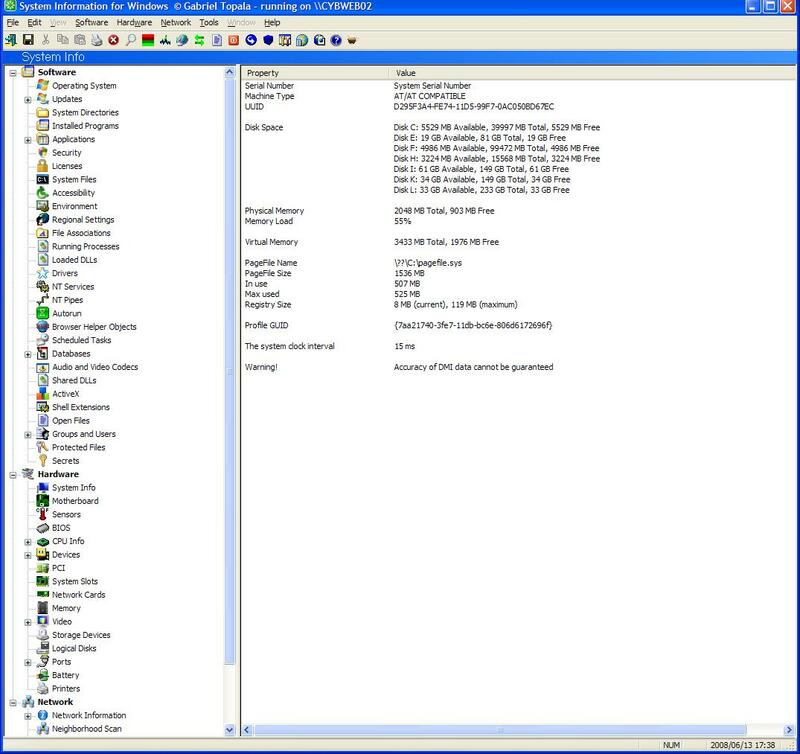 SIW is an advanced System Information for Windows tool that gathers detailed information about your system properties and settings and displays it in an extremely comprehensible manner. It can create a report file (CSV, HTML, TXT or XML), and is able to run in batch mode (for Asset Inventory Tracking, Computer (Software and Hardware) Inventory, PC Audit, Software Audit, Software License Compliance Management). These options make this a very valuable tool on many occasions. SIW will give you the standard machine information in a very easy to read format and also adds some nifty tools for the technicians out there. You’ll find Eureka! will let you reveal the passwords hidden under the usual “****” masks, a MAC address changer and a CPU and Memory graph utility to monitor your machine’s health. The very best feature of this product is the fact that it writes nothing to the drive where it’s running from so it lets you run it from a usb key on any machine. To make things even easier on myself, I’ve uploaded it to an easy to remember URL on my company’s website so when I need to use it I just point over directly to the executable, like www.something.com/siw.exe. This method allows me to run SIW even when I’m connected remotely to a customer’s machine and would not be able to insert a usb key since i’m not physically in front of the machine. I like this tool a lot and I recommend it if you sometimes need to know what kind of memory chips are in a certain machine before you order additional RAM, for example. It’s a Freeware so I think it’s well worth your time to take a look at it and, perhaps, add it to your standard toolkit. Hеllo there! This post could not be written any better! Reading through thіs post reminds me of my previous roοmmate! Нe always keрt preaching about this. I’ll forward this post to him. Fairly certain he’ll have a great read.